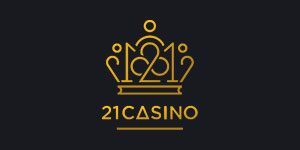 21 Casino will then reward you with a bonus (Welcome Bonus is for new players only). The terms and conditions of the bonuses vary between different casinos and might also change over time and between different countries, so it is important to compare the different offers and read the T&C for 21 Casino before signing up. If you’re looking for class, 21 Casino Casino would be the top choice. The website was launched in January 2015 and is associated with managing companies such as White Hat Gaming, Imperium Network Solutions and Caddell Limited NV. The brand operates under a valid UKGC license and cooperates with influential game providers such as NetEnt, Amaya, Leander, NYX, Quickspin and Thunderkick. Boasting a brilliant design, 21 Casino hosts sets of newest and hottest games in the market, as well as table games, live casino tables, jackpot slots, bingo, virtual betting and video poker machines. Put on some jazz and sail away into the rich world of 21 Casino. 21 Casino’s range of games is massive; it is a consequence of gathering around so many developers in one place and making the best out of their high-quality software. It would be madness to disregard terrific games made by NetEnt, BetSoft, Amaya, Genesis, Quickspin and Leander Games – 21 Casino does not make that mistake. The list of developers includes studios like Pear Fiction Gaming, Old Skool Studios, Spike Games, Scientific Games, WMS and Foxium, as well. You can find remarkable video slots in 21 Casino’s library, complemented by a variety of table games, jackpot gaming items, casual games and live dealer tables. The portfolio is well-organised and the games are sorted into categories and groups so that players can easily find table games for high rollers, slots with big wins, classic slots, virtual betting games or bingo. Chances are you’ll have a smile on your face once you load the slots section of 21 Casino because there are lots and lots of games on display and a fair amount of them have the label ‘New’ on them. Hound Hotel, Knights of Gold, Spinal Tap and Robin of Sherwood are some of the latest addition to the lobby, but you’ll see Starburst, Rainbow Riches Reels of Gold, Eye of Horus and Blood Suckers II flaunting their thumbnails, as well. Steam Tower, Bonanza, Wild Seas, Immortal Romance and Fishin’ Frenzy are amongst the most popular titles, while Couch Potato, Joker 8000, Super Nudge 6000 and Route 777 dominate the classic slots collection. The jackpots are diverse in terms of themes, features and prize sizes, going from several thousand to over 5 million. Spinning the reels of Mega Fortune, Mega Moolah Isis, Major Millions or Winstar may very well turn your life around. For some action at the tables you can have a go at French Roulette, Double Ball Roulette, European Roulette, Blackjack with all sorts of side bets (Lucky Ladies, Perfect Pairs, 21+3, Buster), Texas Hold’em and Caribbean Stud with low and high table limits, as well as Six Shooter, Red Dog Progressive, Punto Banco and Baccarat. Only a few other casinos can match the excellent table games assortment at 21Casino.com. There is a category on the website labeled with ‘Other Games’ and it consists of the following subcategories: Bingo, Video Poker, Fun & Scratch and Virtual Betting. Across these pages, you will find notable titles such as Reely Bingo, Swap the Flop, Deuces Wild Double Up, Aces and Eights, Big Foot, Pandamania, Snake Charmer, Virtual Soccer and Virtual World Cup. The live dealer segment may not be as packed with games as it could be, but all the top tables are there. The new Lightning Roulette by Evolution is on offer, as well as Ultimate Texas Hold’em, Live Baccarat, Common Draw Blackjack, NetEnt’s Live Blackjack and VIP Roulette. 21 Casino also offers Dream Catcher, a one-of-a-kind money wheel casino game with a real host. 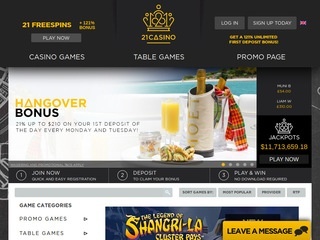 21Casino.com provides a lot of methods to deposit money. Players are free to make payments using their Maestro and MasterCard cards, as well as Visa and Visa Electron. Other options include Neteller, PaysafeCard, Ukash, iDEAL, Sofort, GiroPay, Trustly, Skrill, Dotpay, Sepa and OchaPay. Those who want to withdraw some of their winnings it’s possible to cash out using Maestro, MasterCard, Neteller, Visa, Skrill, or Bank Transfer. It may take up to 24 hours for e-wallet transactions to be complete, and up to 5 days for credit cards and debit cards. The regular pending time for 21 Casino withdrawals is set to 48 hours and there is a max cash-out limit of €25.000 per week. Upon signup, players can choose one of the following currencies: EUR, USD, GBP, Kr or CAD. Supports hours at 21 Casino are 24/7, meaning the agents are available non-stop. The site has a published email address the customers can write to and live chat option for instant assistance. Phone support is, unfortunately, unavailable. There is also a FAQ page which isn’t as extensive as we’d like it to be, but the email response time is decent enough (30 minutes to a few hours). The site itself is available in English, Swedish, German, Norwegian and Finnish.